After being somewhat less than clear about its Windows-on-ARM plans, Microsoft answered a number of lingering questions on Thursday. In an interview, Windows unit President Steven Sinofsky said that the first ARM-based machines running Windows 8 should show up around the same time as the first Windows 8 machines running traditional PC processors from Intel and AMD. He didn’t give a time frame for when that would be, but PC manufacturers and chipmakers have said they expect it to arrive later this year. Sinofsky also said that the Windows-on-ARM machines will come with several Office apps — Word, PowerPoint, Excel and OneNote — that have been tuned to run in a very battery-efficient manner. But Sinofsky said that, although those applications will run in the traditional Windows desktop, they will be the only programs allowed to do so, other than components of Windows itself. 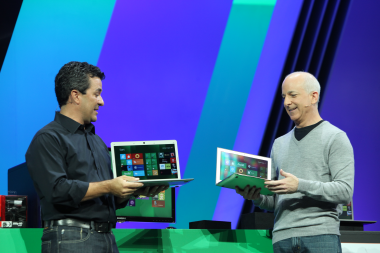 “There are no other compiled dekstop apps that are available,” Sinofsky told AllThingsD. All of the other apps for Windows on ARM will be the new-style “Metro” apps. Windows 8 for Intel and AMD chips, by contrast, will be able to run all of the kinds of programs that have traditionally run on Windows, inside a Windows 7-like desktop environment. Although Microsoft has said that its focus around Windows 8 would be around new-style “Metro” apps, there had been significant question as to whether, and under what circumstances, programs designed to run in a classic Windows desktop might be able to run. Windows on ARM will have the desktop as an option for Internet Explorer, the Office apps and various system functions, such as the control panel, file management and other built-in features of Windows. Sinofsky also said that the version of Internet Explorer for Windows on ARM won’t support plugins such as Adobe Flash, noting the trend in the industry away from supporting Flash on mobile devices. Sinofsky is also penning a several-thousand-word blog post on the subject — long even for someone known for his lengthy posts. In it, Sinofsky said, he goes into more detail on the company’s plans for Windows on ARM, as well as its rationale for some of the decisions it has made. Sinofsky had already ruled out some sort of emulation mode for running older Windows apps on ARM chips, noting that the whole point of running Windows on the same kinds of ARM-based chips used for phones and tablets was to gain the kind of power efficiency those chips can deliver. Microsoft has said it will deliver an updated “consumer preview” test version of Windows 8 on Feb. 29, with plans to tout the software at an event in Barcelona. However, that test version, like a developer preview released last fall, will be available only for machines running traditional Intel and AMD chips. Sinofsky said the company is working with chipmakers Nvidia, Qualcomm and Texas Instruments to provide a limited number of test machines to those that make software, hardware and peripherals. The machines are aimed at developers, though, with easy access to the internals, and the company has no plans to make those machines available to enthusiasts, corporate customers or other testers. Microsoft first announced its plans to allow Windows 8 to run on ARM-based machines at CES 2011. At the time, it showed a demo of some Office apps running on ARM chips, but showed little else of its plans for the operating system. Months before, it talked about other features of the operating system. Several months later, at our D9 conference, it showed the new Metro interface for Windows, as well as its plans to feature a whole new kind of application, and its plans for a built-in store to sell these new apps. While the goal is to have Windows-on-ARM machines out at the same time Windows 8 lands on new traditional PCs, Sinofsky noted that there is a lot of work to be done to get the entire PC ecosystem ready. “We’re building a whole new product, on a new platform, with new partners,” he said. Update: Sinofsky’s blog post is up, all 8,610 words of it.